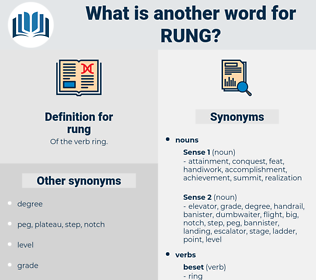 What is another word for rung? 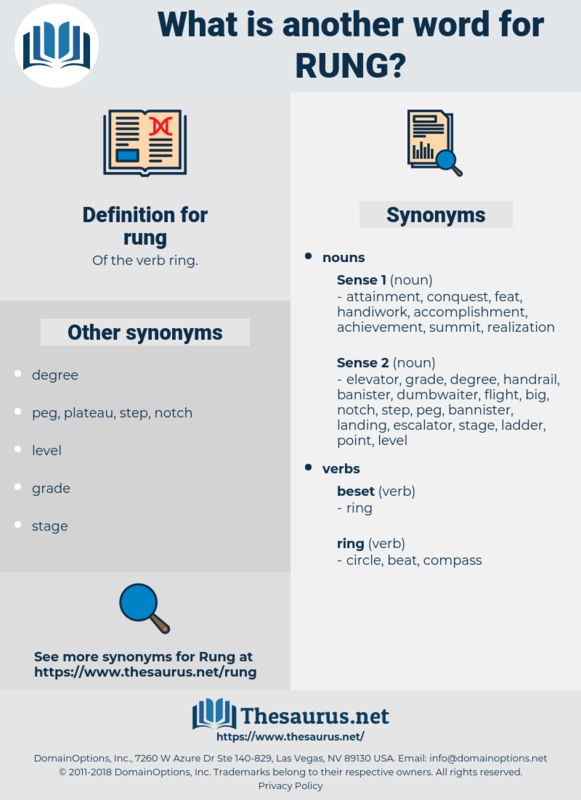 sung, phoned, titled, renamed, labelled, stuck, Summoned, Termed, Knocked, CAILED, confused, Dialed, Paged, struck, poised, Appealed, drawn, come, styled, called, Dubbed, named. But here comes Miss Vernon, and the bell has rung for breakfast. Whatever happens, you will have climbed a rung or two up the ladder of duty, and perhaps of fame. rain gauge, rearing, ranch house, rhamnus, rings, romish, range, rhyming, romance, ruining, Romansh, renewing, romaic, roanoke, rareness, rooms, Romans, reharmonize, reharmonise, remaining, Ramses Ii, rank, roaring, Reims, rhenish, romanize, Rameses Ii, runch, rumex, room access, runic, Rawness, ramus, ramous, rhamnaceae, ramses, ramesses, Rumansh, reminisce, ring, rehearing, remus, raring, Rheims, riming, rangy, roman nose, remains, rhonchus, romanesque, ruinous, romanise, Raunch, rooming house, renounce, rink, running, rain check, rum nose, rain gage, ramose, running shoe, raunchy, Romanic, rnase, ranch, rummage, rayons, rearrange, roominess, raining, Raininess, runniness, rowing, ransack, rameses, renege, rimose, Ramesses Ii, rhyniaceae, rinse, rain-wash, remiss, running away, remake, Remise, Wrung. highchair, folding chair, feeding chair, rocking chair, rocker, straight chair, side chair.